Consumer electronics show IFA sees a lot of product launches, but speakers with built-in assistants, whether Google Assistant or Amazon Alexa, have been announced in abundance. Panasonic and Sony have both launched Google Assistant-powered speakers, while Onkyo has announced two speakers, one with Google Assistant and the other with Amazon Alexa. Kitsound meanwhile, is joining the Alexa party, offering its Voice One smart speaker for £129, undercutting the likes of Amazon Echo. Here are our first impressions. Kitsound describes its Voice One speaker as "the smart speaker you've been waiting for". The device places a focus on sound quality but it is quite a striking speaker in terms of design too, offering a retro but modern look. Measuring 278 x 130 x 130mm and weighing 1.74kg, the KS Voice One is rectangular in shape but it has rounded edges and a top that slopes down for a nice finish. Controls are situated on the front of the speaker in a slim panel with a large circular detailing that protrudes away from the speaker's woven grille and lights up to show when an action is taking place. Three of the speaker's faces feature the soft-to-touch woven grille that has a stain resistant nano-coating allowing you to use the Voice One speaker in the kitchen when you're cooking if you so wish, while the rear face is a hard plastic. The charging port, along with a separate USB port for charging devices are positioned at the bottom of the speaker on the rear. The Kitsound Voice One features the Amazon Alexa voice assistant, meaning it won't just play music from the likes of Spotify, Amazon Music or TuneIn but you'll also be able to get the news and weather, control your home and ask the Voice One questions, as you can Amazon Echo. With Alexa, you can add specific skills in order to help her perform various tasks, such as order a pizza, read books or even become a personal trainer. There are thousands of skills available, including Spotify, Hive, Jame Oliver, Philips Hue, Just Eat and Uber, among others. 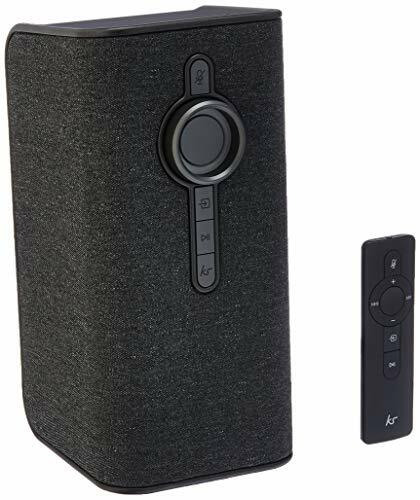 The Kitsound Voice One also has what the company calls TLC audio boost and it has multi-room technology built-in, allowing you to connect up to eight Kitsound Voice One speakers together in one group. An external music source can also be connected to the Voice One, allowing you to play your tracks in multiple rooms over Wi-Fi, and there is also Spotify Connect compatibility. Additionally, the Kitsound Voice One speaker can be paired to another Voice One speaker for left and right stereo pairing. The Kitsound Voice One offers 20-watts of power with a bass reflex to amplify sound and hand-tuned custom-designed drivers for audio quality. The drivers are 2.5-inches and the Voice One offers a frequency response between 60Hz and 20kHz. There is Bluetooth and Line-In connectivity on board, as well as Wi-Fi connectivity and users can also use a remote to control the Voice One if they don't wish to use their voice or the controls on the device itself. We didn't get a chance to test the sound quality of the Kitsound Voice One properly during our time with it as the busy trade show halls make this near on impossible, though despite the hustle and bustle, the speaker appeared loud, responsive to voice commands and fluid in operation. We will test it further when we come to review it in full though. The Kitsound Voice One has a stand-out design with a nice, premium finish. Although we weren't able to test the sound quality, the Voice One appears to offer plenty of useful features and Amazon Alexa worked well from what we saw of it in action. Whether it will be the speaker we have been waiting for in the Alexa compatible field remains to be seen for now but we will let you know as soon as we have it setup in our home playing our music and listening to our commands.